La Moqueuse berth at the Suva Port. 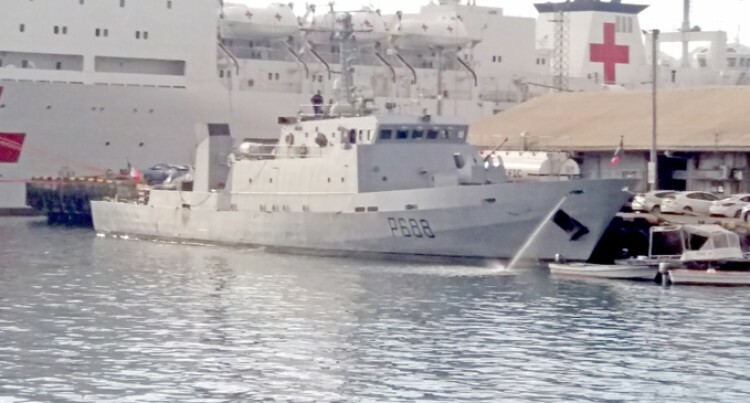 French navy vessel La Moqueuse called into the Suva Port last Friday in its fifth call to replenish its supplies’ is here for security and supply. The last time the French patrol navy vessel was in Fiji was in 2016 when it came to help the National Disaster Management Office (NDMO) teams assist those affected by Tropical Cyclone Winston in the Lau Group. During that trip the vessel also brought two tonnes of emergency relief kits from the French Red Cross which included hygiene kits and temporary shelters. “We have this strong co-operation because we are neighbours and French naval armed forces from New Caledonia are here for purpose that is security and supply,” France ambassador to Fiji, Sujiro Seam said. “As a neighbour, we have sovereign strategic interest in the South Pacific and therefore have strong interest in co-operating with our neighbours including defence and security issues,” he said. According to Mr Seam French the vessel has the capacity to conduct surveillance activities in any Pacific neighbour’s Exclusive Economic Zone (EEZ). “We also do surveillance for illegal unreported, unregulated fisheries which is the matter of competence for the ministry of fisheries and its very serious here in the South Pacific,” he said. “We need the National Disaster Management Organization (NDMO), as our navy also has the capacity to conduct humanitarian co-operation. “Our officers usually board other ship and to check if there is any illegal activity including drugs or illegal fishing activity happens,” he said. The EEZ is an area beyond and adjacent to a coastal State’s territorial sea to a limit of 200 nautical miles from the baseline. Within this zone, the coastal State may exercise sovereign rights over exploration, exploitation, conservation, and management of natural resources and other economic activities, such as the production of wind or tidal power. French naval ship left for Tonga on Sunday; then to Jarkata, Indonesia soon afterwards.